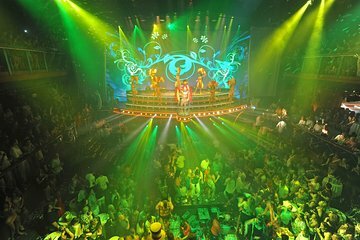 Dance the night away at CoCo Bongo, one the most extravagant nightclubs in Cancun. Cover bands of popular musicians like Beyoncé, the Beatles, Madonna and Lady Gaga perform every night. Watch a spectacular light show, remarkable acrobats and live musical entertainment. Sip unlimited drinks from the domestic open bar as you dance, watch the show and meet new friends. Upgrade to the VIP Pass to use the club's special entrance and get a better view of the stage while enjoying unlimited premium bar service. Viaje al cercano club nocturno CoCo Bongo y llegue al ruidoso club, conocido por sus espectaculares espectáculos de luces, bandas de covers en vivo y entretenimiento acrobático. Si desea omitir las largas líneas de entrada que contienen otros 1000 clientes del club, compre un pase VIP e ingrese por una entrada de prioridad especial. Acércate al bar para disfrutar de bebidas nacionales ilimitadas mientras disfrutas de la gran variedad de entretenimiento: acróbatas que cuelgan del techo, espectáculos de luces deslumbrantes y entretenimiento musical en vivo. Podrías ver versiones de los espectáculos de Broadway o bandas de covers tocando en vivo a Madonna, Lady Gaga, Frank Sinatra o Guns N 'Roses. Actualice a VIP para los asientos de entrepiso, que incluyen más espacio personal y una vista mejorada del escenario. Disfruta de las bebidas de la barra libre premium toda la noche sin mover un dedo; un atento personal estará a su entera disposición. Cuando haya terminado su fiesta, tome un taxi fuera del club y regrese a su hotel. The tour was good. Private driver showed up exactly on time. Only complaint was that we were dropped off at Coco Bongo with no clear direction on where to go. There is a VIP booth that we had to find - and once that happened, we were good to go. Driver had limited English skills which was tough. Whole evening was brilliant, staff extremely attentive and although such a diverse age group Coco Bongo's has something for everyone. We arrived at 10pm and left at 03.15am and enjoyed every minute of it. Our friends from Wales their first time were simply amazed. It was our second time after visiting in 2013 and this time was even better than the first. A MUST do for everyone who visits Cancun. Thank you and ENJOY it!